After all the excesses of the holidays it’s time for a walk to get rid of some of those extra calories! 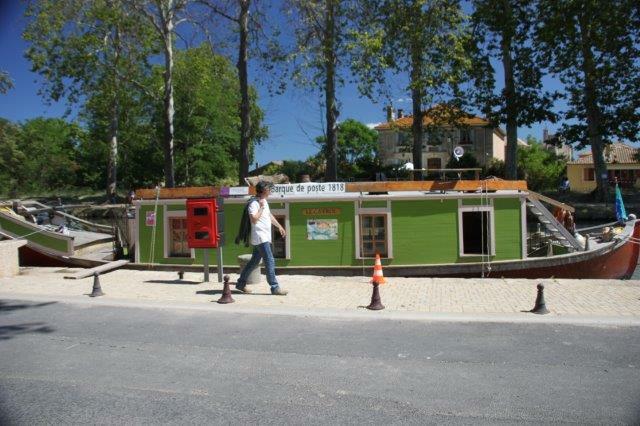 How about a walk along the Canal du Midi? I promise you it’ll not be too strenuous, and there won’t be any steep inclines! A walk along the Canal du Midi puts you in the footsteps of Pierre-Paul Riquet, a native of Beziers, who had the vision and the tenacity to get the canal built. As you walk, think about the people who built the canal – 12,000 “head”, men and women – with three women counted as one head – working away with only the most basic tools. 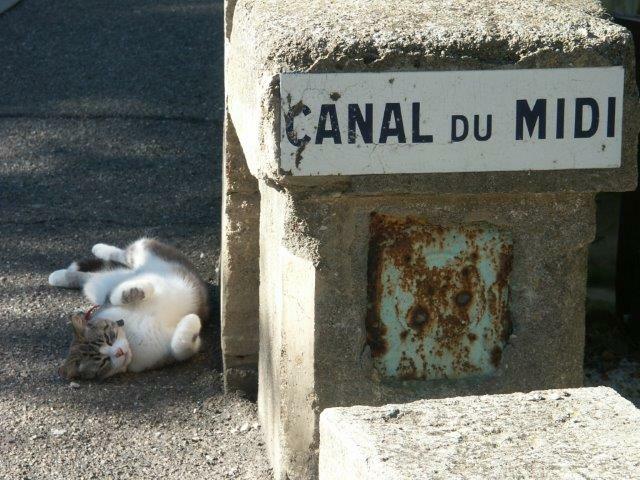 And yet they got the canal built from Toulouse to Agde in just 14 years, from 1667 to 1681. 240 km of canal, 20 to 24 m wide and about 2.5 m deep, with 64 locks (single, double, triple or quadruple), numerous bridges. a few viaducts and an enormous dam – all built entirely by hand! A colossal undertaking, and even more impressive when you consider the times during which it was built! Nowadays the Canal du Midi is mostly frequented by pleasure traffic, and its chief glory lies in the fact that its banks are lined by tens of thousands of mature trees. Initially Riquet only planted trees to stabilise some of the raised banks overlooking the plains, using mostly willows because of their rapid growth. Later, mulberry trees were planted along the canal, the leaves being used to feed silkworms. When silk production came to an end, Italian poplar trees replaced the mulberry trees as a productive crop, and it was only during the First Empire that the plane trees took over as the dominant tree along the canal. Today the plane trees are becoming the victims of globalization: towards the end of the second world war a fungus was imported from North America, brought to France on wood used to make ammunition crates. The canker stain of the plane tree is a microscopic fungus which develops inside the tree and blocks its sap channels, thus eventually killing the host plant. So far no cure has been found, and the spores of the fungus can be distributed by air and water. Over the years the fungus has slowly spread across southern France, and it is estimated that more than 40,000 plane trees along the Canal du Midi will have to be felled and re-planted over the coming years. They will be replaced by plane trees resistant to the fungus, as well as a host of other species such as ash and lime. So the landscape along the canal will change, but think of it as an evolution – in some places the canal may look “naked” for a little while, but the new trees will soon grow! If you want to know more about the replanting campaign along the banks of the Canal du Midi have a look here – your donations will help to ensure that the canal will look beautiful again! I hope you’ve enjoyed our little walk – time for a cup of tea?? P.S. Apologies to all e-mail subcribers to the blog – I accidentally hit the “publish” button while preparing this post, so you had a semi-finished version of this piece in your inbox on Monday. 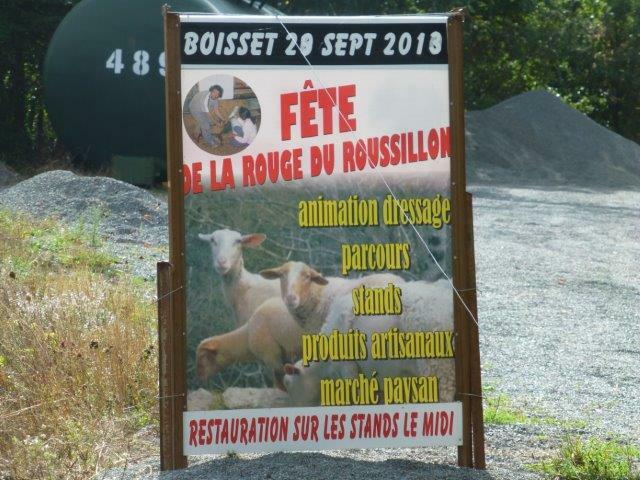 The Fete de la Rouge du Roussillon celebrates a rare breed of sheep, which is still being kept in Boisset. It’s as good an excuse as any for a fete! The approach to the village is breathtaking, as the road winds along hillsides and overlooks steep drops, but don’t worry, there’s enough space for cars to pass one another. 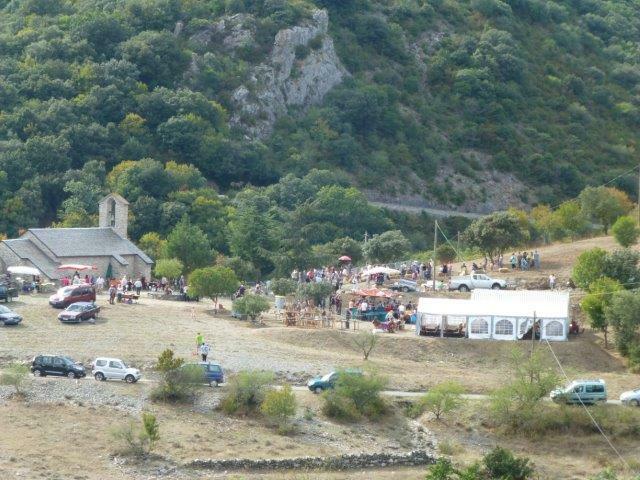 The fete was being held on a piece of land just next to the church, and for some reason the church at Boisset is a little distance outside the village. From my vantage point the village is not even visible, but it is there, hiding below on the right. 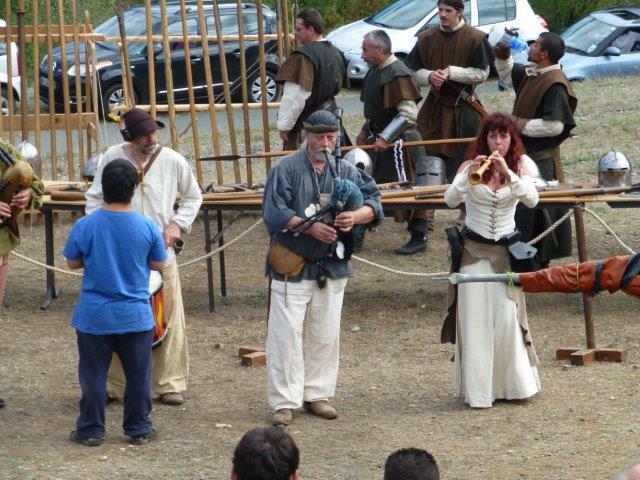 I arrived just around midday, and the fete was already in full swing. The first thing I did was to say hello to the Rouge du Roussillon sheep, since they were heading the bill. And before you ask, the rouge in the name refers to the reddish-brown head and legs of the animals. I’ve not been able to find out a great deal of information about this breed, as not a lot of history appears to be known. 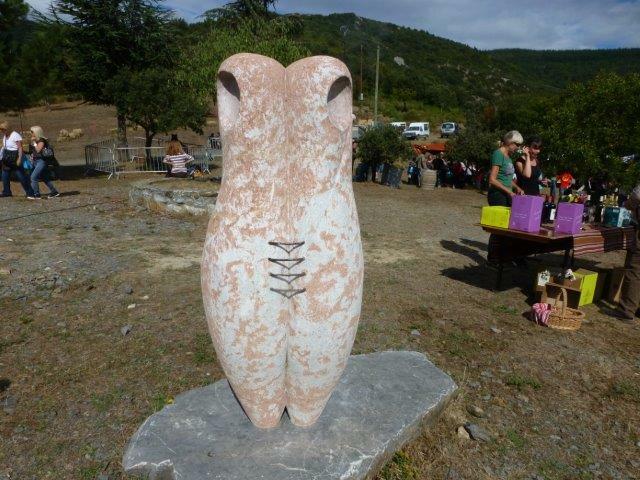 It is certain that there have been “red” sheep in the Roussillon for around 200 years, and it is thought that the ancestors of the race might have been brought over from North Africa at some point. Up until about 30 years ago it was estimated that there were at least 10,000 “red” sheep between Narbonne and Perpignan and the hills beyond, but the decline of the population was rather rapid. In 1981 the last shepherd to raise this race sold his flock, and ever since then conservation efforts have been made to preserve the breed, both in France and in Germany, by a number of dedicated individuals. The Rouge du Roussillon is a multi-purpose race: it produces fine wool, and good meat. 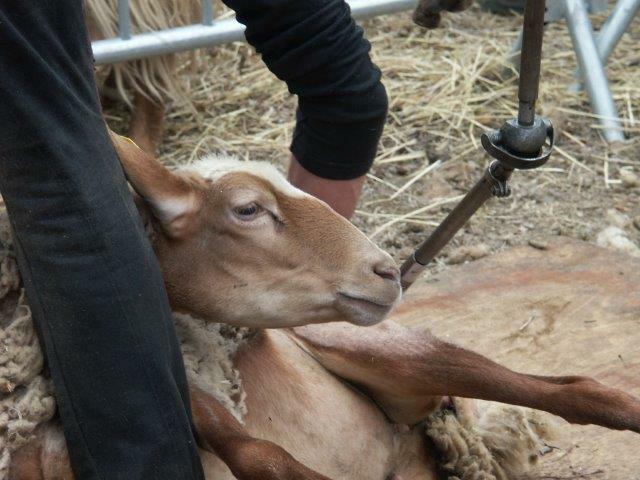 As part of the fete there was a sheep shearing demonstration – and I managed to shoot a little video. For e-mail subscribers, please go to the site to watch the video. I am always amazed at just how calm sheep can be whilst they are being shorn. They struggle a bit when they get on the platform, but once the shearing begins it’s almost as if they are putty in the shearer’s hands. The lady who was doing the demonstration was being very careful and took her time. Look out for her shoes, they are made of felt to avoid any injury to the animal. The black stuff you see dabbed on is an antiseptic – the clippers must have nipped the sheep a little, despite the shearer’s careful attention. Back to more serious matters though – which of course means food! It was midday and I had to get something to eat before it all sold out!! 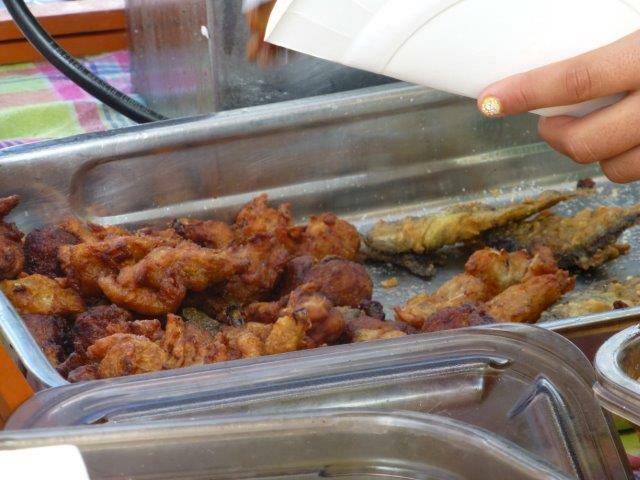 There were several stands, offering a variety of yummy things! 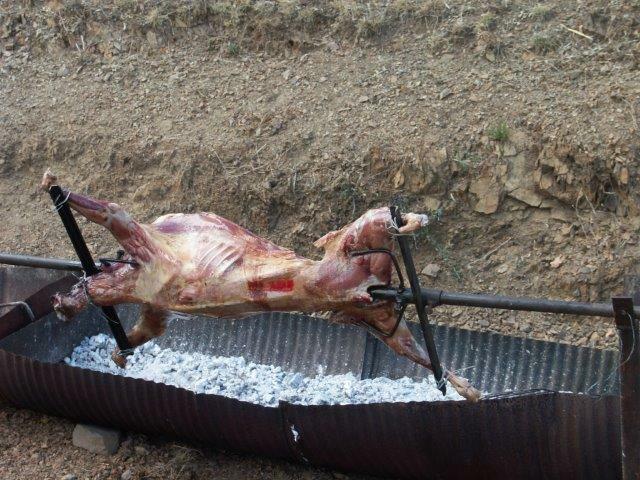 I had seen that a whole lamb was being spit-roasted at one stand when I arrived at the fete. When I went to look for food it had pretty much all gone, but they were grilling other bits of meat. Don’t you just love the contraption for turning the spit?? 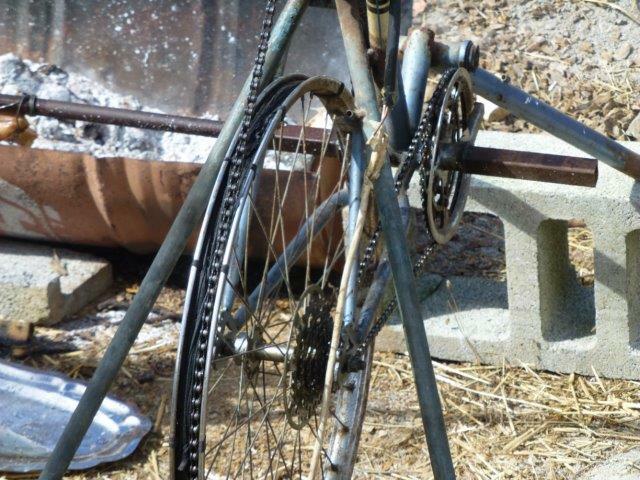 Unfortunately there was nobody pedaling! … well, you could buy the trout fresh out of the tank, take it home to cook and eat it, but for eating sur place they had prepared other things: ecrevisse (crayfish), which are like miniature lobsters, truitelle, which is very small trout, prepared like whitebait (the fish are about as long as your middle finger), and accras a la truite, deep-fried fritters made with trout rather than the usual salt cod. 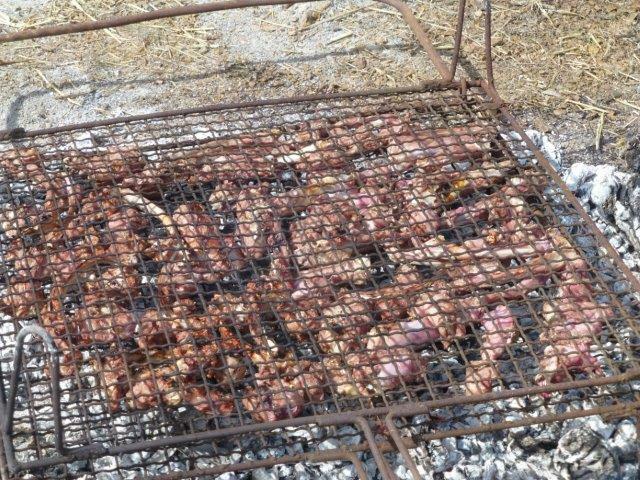 No prizes for guessing what I had for lunch – of course the accras won! And I’m sorry, you won’t see a picture of what I had, as holding the camera with one greasy hand whilst holding the food in the other proved just too tricky :-)! After the food there was more entertainment! First a visit to the church, which dates back to the 12th century! It is very small, but then a village of around 27 inhabitants would not need a very large church. The church had certainly seen better days, but there are still two splendid crystal chandeliers, and you can tell from one of the altars that they must have been very proud of their church once. 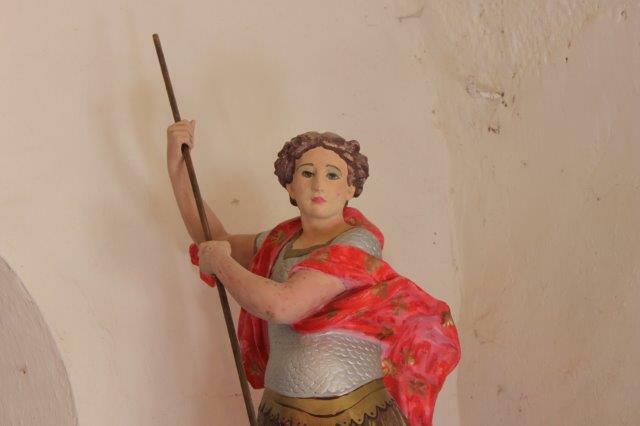 But what’s with re-painting the statue of St Michael? Who ever thought that bright-red would be a good colour for his lips?? It seems to have faded a little since the last time I saw that statue a few years ago, but still! A couple of stands had been set up inside the church. 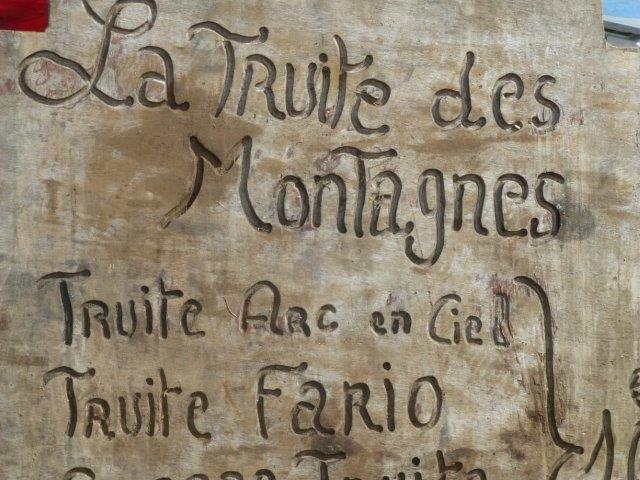 One was a historian who was selling the books he had researched of all the villages which had once belonged to the Seigneur of Minerve. I couldn’t resist the book about Saint Jean de Minervois, and will be reading all about that in due course! At the other stands paper things like cards and drawings were for sale. Back outside the church there was a display of weapons and armour, which would have been used by knights in olden days. The helmets were beautifully shiny, and the one which was not (i.e. slightly rusty) reminded me that originally these items were all made before the days of stainless steel, and required hours and hours of polishing to maintain them looking good. And these replicas were made in the same way and I imagine require the same TLC! I spent a most enjoyable afternoon at this small fete! Make sure you go if you are in the area when it takes place next year. Just one thing before I leave you – this sculpture stands by the church – any ideas what it might represent? Goodbye Boisset, til next year! What better way to spend a Sunday afternoon than by the waters of the Canal du Midi. 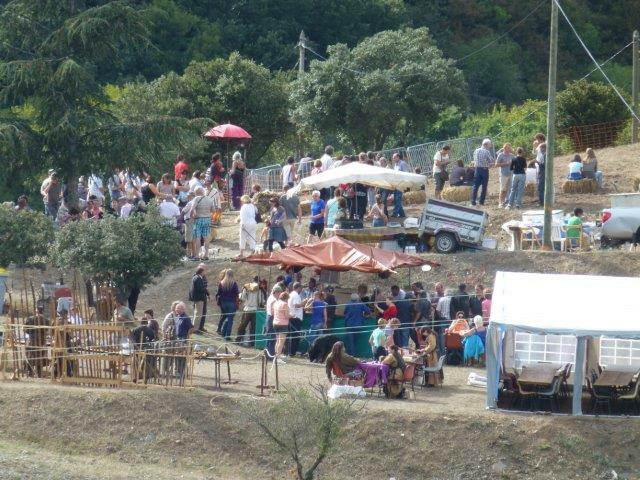 A little fete had been organised in Capestang by the tourist office a couple of weeks ago, and since the weather was perfect I couldn’t miss it! 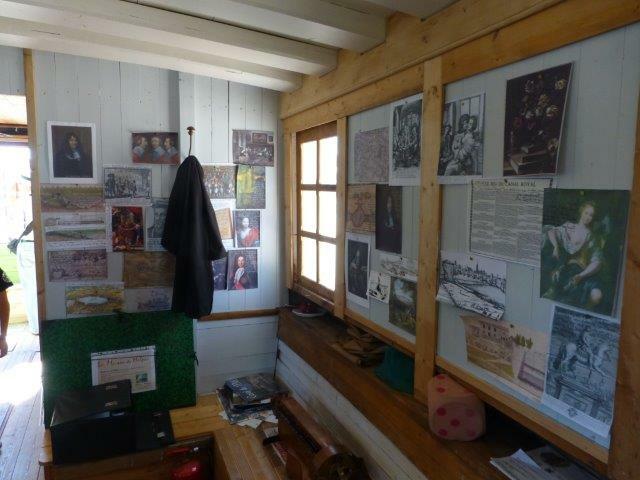 One of the main attractions was a replica of a post barge from 1818, offering a glimpse of horse-drawn transport from a bygone age. Le Cairol was moored up in harbour when I got there, and Robert Mornet, the man behind the construction of the boat, welcomed us aboard for a brief tour. 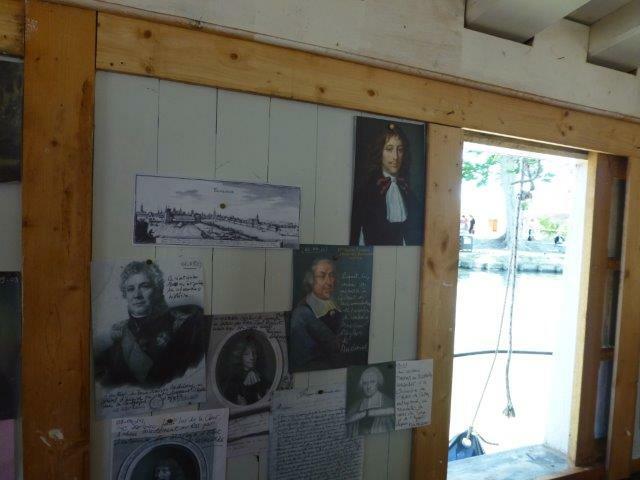 It soon became evident that travel in the early 19th century was not particularly comfortable – the main room of the boat would house 30 passengers, and there was only one toilet on board! In the salon next door, those who had more money could travel in a little more comfort, but I imagine that it was not in the lap of luxury. 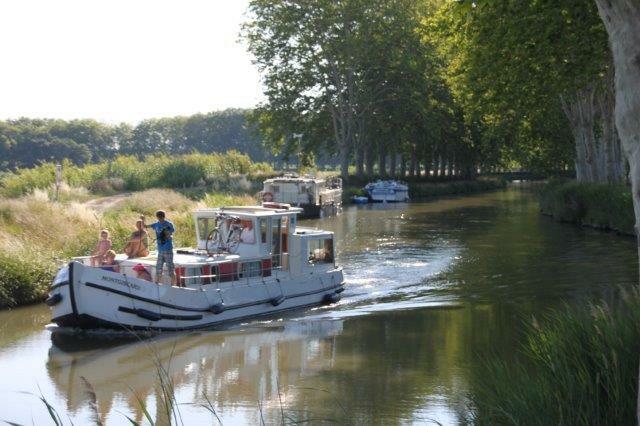 The post barges were put into service by the administration of the Canal du Midi when it was first opened in 1681, and in the early days passengers got off one boat and onto the next one at each lock, so as not to waste time and water by going through the locks. 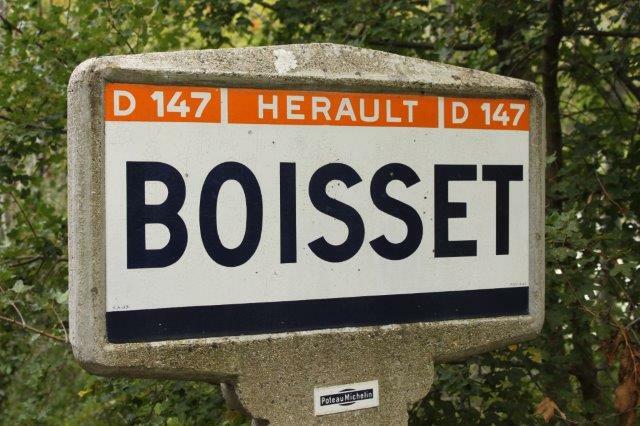 Later on the service got somewhat faster and from 1834 the express service took only 36 hours to cover the 240km between Sete and Toulouse. At its peak, the barges transported 100,000 passengers annually, but with the advent of the railways, passenger numbers declined and the last post barge sailed in 1858. 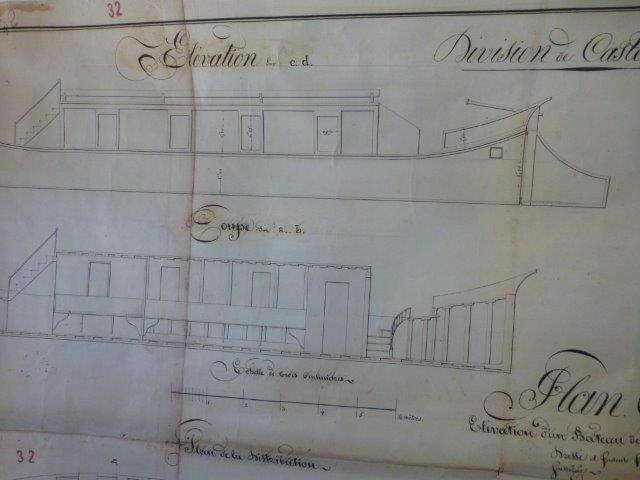 Except in the records, no trace of these boats remained and so in 2007 Robert Mornet started to recreate a barge from plans found in the archives. You can find out a little more about the barge and its construction here. One thing to remember is that the barges were strictly for transport – no food was served, and passengers could not sleep on board. For eating and sleeping there were auberges along the canal (see my earlier post about the Musee du Bitterois for a picture of the reconstruction of the interior of one such auberge). There would also have been places along the way where the horses were changed. Take a walk along the Canal du Midi from La Redorte towards Homps and you can still find the buildings of a former auberge at La Dinée. The design of the barge is ideal for the canal as it creates hardly any wash, so no disturbance to other boats nor the banks of the canal as it passes by. After all this excitement I took a stroll into Capestang for a drink – I decided that the restaurant/bar on the banks of the canal was taking just a bit too much of an advantage of its location. 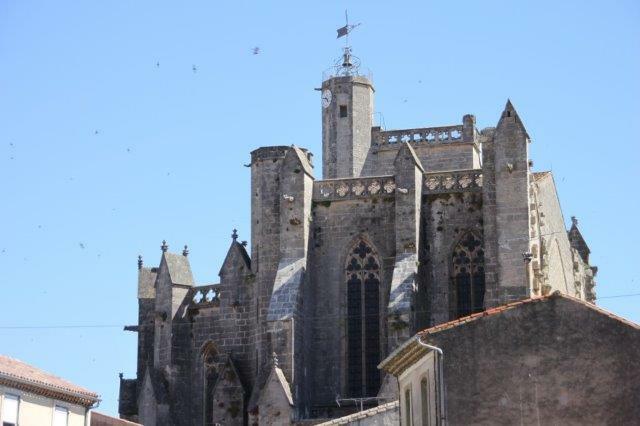 In the plane-tree-shaded square to the side of the towering gothic church in the centre of Capestang are two cafes and it was very pleasant sitting in the shade, sipping a drink and eating an ice cream :-). Back to the Canal and across the more modern bridge, where I caught another glimpse of the Cairol floating along, this time under motor power rather than horse power. I made my way back to the port, past the marché des producteurs (farmers market), and while I was gone a small theatre set had been erected in front of the tourist office, and I was just in time for the show to begin. “Tandem” was a mix of acrobatics, circus and music, very touchingly enacted by two performers who make up L’Appel du Pied theatre company, Geneviève Guillaud and Pierre-Alban Monfreux.